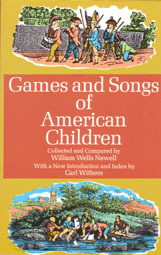 In 1883, William Wells Newell gathered the melodies, rules, and movements of 190 games and songs. These were collected in part from the children themselves and also from adults remembering games of their youth. Lyrics or play instructions for 190 games and songs are included along with the history and origin of each game or song. Lyrics and music staff melody line are included for 36 songs including "As We Go Round the Mulberry Bush", "The Farmer in the Dell", and "London Bridge is Falling Down"
PUBLIC DOMAIN STATUS: This book is an unabridged reprint of the 1903 second edition of a work first published by Harper and Brother in 1883. The 1903 preface to the second edition is included along with an introduction to this 1962 Dover reprint. This edition has been thoroughly indexed and the 16 page Appendix offers extensive bibliography and notes. Since this is a reprint of a work published in 1903, all the songs, games, music, and lyrics are in the public domain in the United States. This may not apply in countries outside of the United States where copyright protection may exist.